PDVSA ships fuel to Syrian regime: Chavez risks sanctions? [Edited Tues 630 EDT] The Negra Hipólita, a tanker operated by an affiliate of PDVSA, should be arriving at the Syrian port of Banias after a 15-17 day voyage from the Venezuelan refinery at Puerto La Cruz (El Universal, 17Feb12). In Vienna, the U.N. chief demanded the Syrian regime stop using indiscriminate force against civilians caught up in fighting between government troops and Assad’s opponents. “We see neighborhoods shelled indiscriminately,” Ban told reporters. “Hospitals used as torture centers. Children as young as ten years old jailed and abused. 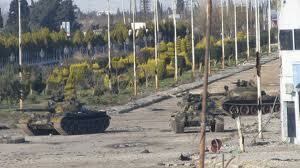 We see almost certain crimes against humanity.” (Time World, Syrian Troops Shell Central City with Tanks. 17Feb12). Chavez’ motivations: Why risk sanctions? Is this a significant material assistance to Assad’s regime? Has Chavez blundered by miscalculation? 1. Chavez’ motivations: Why risk sanctions? President Chavez has clearly been extremely agitated about the dilemma of Syria’s Assad, and is quite happy to have found some material way to assist him. (For his defense of this shipment, see: AP 17Feb12). For Hugo Chavez, the Arab Spring and the U.S.-Iran conflict have been just one huge frustration. Many analysts recognize his obvious fear of geopolitical isolation as these autocratic regimes retreat. However, it should be noted more specifically that he is also losing his most powerful allies inside OPEC, the historical heavyweights of its “price-hawk faction” which once included himself, Gaddafi’s Libya, Iran and Saddam’s Iraq. Hugo Chavez tried various diplomatic schemes to save Gaddafi from the popular rebellion and to block NATO intervention, even offering Gaddafi asylum in Caracas, all to no avail. He has also wanted to aid the Iranian leadership, now his only remaining OPEC-heavyweight ally; but, again, he has been unable to do much of anything concrete. As I stressed in a recent post, (With a USA-dependent oil sector, Chavez can’t help Ahmadinejad, 18Jan12) Hugo Chavez was forced to send Ahmadinejad home empty-handed in January when the latter came looking for help against U.S. and E.U. sanctions. Chavez simply could not help Ahmadinejad, at least not openly, because of the clear certainty that PDVSA and his government would open themselves to U.S. sanctions if he was again caught aiding Iran. But, why does Chavez care about U.S. sanctions? Because of the continuing abject reliance of Chavez’ government on selling oil to the U.S., its reliance on access to the U.S. bond market for raising capital, and its reliance on foreign investment by companies that do business in the U.S. that will not flaunt any U.S. Treasury Department sanctions placed on business with Venezuela. In short, considering this economic dependence, Chavez absolutely cannot risk any new U.S. sanctions on PDVSA or on his government. However, he has found a way to make a material contribution to preserving Syria’s Assad, and thereby to aiding Iran, as Syria is Iran’s only Arab ally. If Assad falls to a popular revolution like Gaddafi, Iran would be significantly more vulnerable geopolitically. 2. Is this a significant material assistance to Assad’s regime? Indeed, this is a material contribution to keeping Assad in power. The Syrian regime has faced significant fuel shortages for its military and civilian population due to internal attacks on pipelines and fuel trains by rebels, E.U. oil sanctions, and the reluctance of international fuel traders to deal with the regime. Indeed, many reports from Syria reflect shortages of heating oil, of oil to fuel electricity production, and for automobiles as the E.U. fuel sanctions and rebel attacks inside have taken a bite. (I have thus far been unable to find specific numbers on how much fuel the regime has lost per month.) In this light, this delivery by PDVSA is clearly important, though not game-changing, unless it were repeated with some regularity. 3. Has Chavez blundered by miscalculation? If Chavez and PDVSA President R. Ramirez execute this carefully, it appears that Venezuela will not be immediately subject to any measures under the E.U. or U.S. sanctions thus far imposed on Al Assad’s regime. At Reuters (16Feb12), Marianna Parraga and Emma Farge, have the best examination thus far of PDVSA’s apparent lack of exposure for this delivery (also, I’m thankful for personal communications from an expert analyst group in N.Y.). Moreover, the fact that this is actually the second shipment from PDVSA, using the same tanker it used in November 2011, tends to confirm this assessment. However, February 2012 is not November 2011. A lot has since transpired, and, in my estimation, Chavez is walking an increasingly fine line. He is, of course, acting under the assumption that, since China and Russia vetoed the U.N. Security Council resolution against Syria, that he is in the club of two Great Powers in bucking the U.S., E.U. and the Arab League (including bucking his Arab-OPEC opponents). However, as I have written here repeatedly, I do not believe he can rely on China for geopolitical cover from the U.S. (I have also tried to demonstrate that even Iran cannot expect any game-changing cover from China). On the other hand, Russia is not only more able to be more assertive with the U.S. over Syria, it also has greater interests in doing so, as Syria provides the Russian Navy with its only port in the Mediterranean and is crucially important for Moscow’s ability to project power and remain a significant player in the region. However, this does little or nothing to shield PDVSA from any future U.S. or E.U. imposition of sanctions should Chavez provoke such a reaction. More generally, however, as compared to last November, much of the Arab League, the U.S. and E.U. are now in no mood for countries to give material aid to Assad’s regime. If Iranian influence in Syria were cut, by the fall of Assad, this would be a game-changer for the balance of forces between Iran and the U.S./E.U. in the present nuclear-and-oil-sanctions confrontation. And, beyond the the Great Powers, U.S. General Assembly has now voted overwhelmingly to urge the Assad regime to leave power. The vote, last Thursday, on a resolution backed by the Arab League, passed with a resounding 137 yes, 12 no, and 17 abstained. Venezuela, of course, voted with Russia, China, Cuba, and North Korea, greatly undermining its former image as representing a new democratic trend of opposition to the U.S.
Chavismo’s geopolitical isolation in Latin America on issues of Iran and Syria has grown significantly since last year (e.g., Brazil et al are no longer interested in intervening in the U.S.-Iran crises as in mid-2010). So too, another traditional base of support for Chavez, the international Left and progressives, has overwhelmingly come to support the Arab Spring movements. Therefore, Chavista opposition to these popular revolutions has become more and more an embarrassment in progressive/left circles and in Latin American diplomacy–albeit still, unfortunately, a rather quiet embarrassment. Chavismo has effectively been sacrificing these two long-time, well-tested bases of his support in a rather desperate effort to prop up especially Gaddafi (which failed), and Iran, as its only two remaining big OPEC allies. On the one hand, its deep economic interest to save its “price-hawk” faction allies within OPEC threatens to ruin its relations with left and center-left Latin American states and peoples, much of the Middle East street and many governments there, and with the international left. Yet, on the other hand, because of Chavismo’s utter failure after 13 years to accomplish any real economic independence from the U.S., it cannot really do anything very bold in support of its chosen Iranian and autocratic-Arab allies whenever there is a real likelihood Venezuela would be sanctioned for those actions. For now, should the international community put greater sanctions on Assad, it seems to me doubtful that Chavez would violate these sanctions any more than he is willing to egregiously violate Iran sanctions, as I have previously described. This entry was posted in Chavez, China, Euroepen Union, European Union, Faja of the Orinoco, Gaddafi, Hugo Chávez, international relations, Iran nuclear, Iran sanctions, Libya, OPEC, PDVSA, Resource conflicts, Sanctions, Syria, The USA, Uncategorized, Venezuela diplomacy and tagged Assad, Chavez, Hugo Chávez, Iran, Middle East, Puerto La Cruz, Syria, Venezuela. Bookmark the permalink.